A beautiful red striped façade of the main house and a cute little tower set among immaculate gardens gives the entire property a fairytale setting. The owners spared no expense when it came to the interior design either. Both the main house and tower are done is soft colors and have luxurious fabrics and plush furniture, hand blown chandeliers and magnificent frescoes. Parquet floors, exposed wood beam ceilings, Venetian ceramic fireplaces and spacious and airy rooms emits a cozy atmosphere. This very special home is has been in the same family for centuries and since the late 1800's has been used as a country retreat for its Venetian owners. It now can be your very own retreat. Enter into the spacious living room with high quality wicker furniture. The living room leads into the dining room with fireplace and Venetian painted armoire. The modern and fully equipped kitchen is beyond the dining room. Staircase brings you upstairs to the two double bedrooms and two bathrooms with bath and shower. The mansarda, or attic room, has a Double bedroom with skylights to give the room an open feeling. Garden terrace with spectacular views and table and chairs for al freso dining. 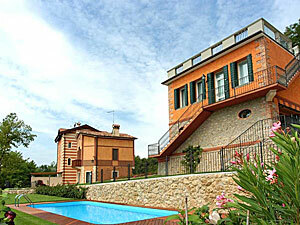 Just 10 meters from the main house is a separate tower that looks over the swimming pool. The tower has been restored into a beautiful independent one bedroom apartment. An exterior staircase takes you to the first floor where you enter into the living that leads into the eat in kitchen. From the living room you will find the double bedroom and a bathroom with shower. Breathtaking views from the rooftop terrace where you can have a romantic dinner for two or eight. Lovely paths that meander through the gardens and to the in ground pool. Private Inground Pool, 8 x 4 meters, Air Conditioning, Pets Okay, Central Heat, Breakfast Available, Views, Air Conditioning and Heating included in the price!